At the Snohomish County Courthouse, child interview specialist Gina Coslett of Dawson Place shows off Harper Lea, a 2-year-old lab trained to comfort children who are being asked to talk about crimes, or testify in a trial. Harper is a new addition to Dawson Place, which is the county's child advocacy center. Harper is a dainty blonde with a heart for service — and chew toys. Last month, the 2-year-old Labrador retriever started working at Dawson Place, the county’s child advocacy center that serves more than 1,000 abused children a year. Harper is a special pooch whose job is to offer kids comfort at times when they may be scared, confused and uncomfortable. She snuggles with children who are asked to recount horrific crimes committed against them. Her coat often soaks up their tears. Harper senses when kids need to be nuzzled or when a good dog trick will chase away the hurt. Since she was a puppy, Harper has been raised to be a service dog. 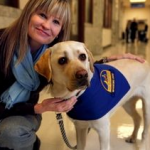 She received extensive training through the California-based Canine Companions for Independence. Her handler, child interview specialist Gina Coslett had been waiting almost a year to be paired with Harper. Coslett was convinced that she wanted a canine partner after working with another service dog named Stilson. 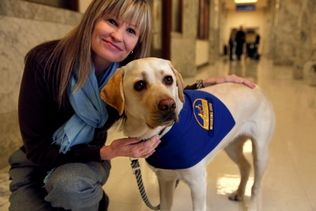 Stilson, a stocky black Labrador, works in the Snohomish County Prosecutor’s Office and has helped out at Dawson Place. When he came to the office in 2006, Stilson was only the second service dog in the nation used by prosecutors. He was so good at his job that people were convinced that Dawson Place also should use a service dog to help child victims. The center offers centralized assistance for physically and sexually abused children. Medical personnel, counselors, advocates, state caseworkers, prosecutors and police are available in the same building to help streamline assistance to children and their families. Children and teens receive free medical exams, mental health assessments and counseling. The center also houses detectives and prosecutors who investigate crimes against children. Now through a partnership, the county’s law enforcement agencies all pay for Coslett’s salary and Harper’s expenses, said Mary Wahl, the executive director at Dawson Place. Harper lives with Coslett and has become a part of the family. She’s even teaching Coslett’s other dog, Duca, a miniature Pinscher and rat terrier mix, some much-needed manners. “They really are best friends,” Coslett said. Harper loves to play, chase balls and buddy around with other dogs, but when her work vest is on she’s all business. As a forensic interview specialist, it’s Coslett’s job to ask children about alleged crimes, either committed against them or witnessed by them. She must remain neutral and disconnected from the emotions that often fill the room during these interviews. She can’t hug the child or offer them any comforting words. There is no parent with the child and Coslett isn’t a therapist. That’s not her role. “It’s so hard not to reach out, whether I believe them or not,” said Coslett, a mom and grandmother. That’s where Harper comes in. The friendly pooch greets the children and sits next to them while Coslett asks questions. She lays her head in their laps. Small hands pet her shiny coat. Sometimes it is easier for children to talk to her about their hurt than to the adult in the room. Harper won’t leave their side until Coslett gives the command. Coslett said it is remarkable to see the dog follow a child’s cues. She senses when to get closer without being told. Harper can smell stress and fear. The kids also like her tricks. She can turn off lights, give a high-five and carry her own leash. It’s heartening to hear a child’s laugh or see him smile after hearing about his pain in such detail, Coslett said. Harper provides some of that healing. The book reflects on justice, doing the right thing and love, Coslett said. Harper seemed like a fitting name for a dog with so much heart. This entry was posted on Thursday, December 27th, 2012 at 11:09 pm	and is filed under Dogs, Human-Animal Bond, Pet Therapy, Service Animals. You can follow any responses to this entry through the RSS 2.0 feed. You can leave a response, or trackback from your own site.